Pace strategy during any event, be it a triathlon, basketball game, or speed skating, plays a very large part in the outcome of your event. Perform at a lower pace and you might be out run by your competitors without the ability to make a come back. Perform too fast and you may exhaust yourself prematurely. Finding the balance is where practice and analysis comes in. Saturday’s run was an endurance run, meaning slow and steady for a longer distance. I was a little nervous going into this workout since the longest I had run following the sprained ankle was a 5k (33min). This workout was expected to last one hour and cover at least 5 miles, hopefully more. I wasn’t sure if my body was able to go the distance. 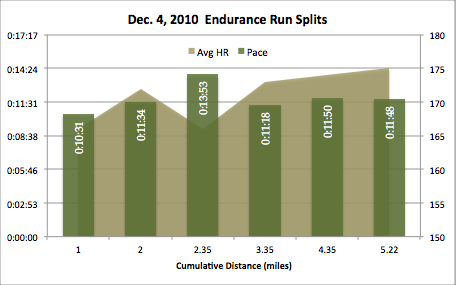 The first half of the run had a more sporadic pace than the second half. In fact, the second mile was more of an interval workout with fast pace for 0.25 mile and then a fast walk. The third split (2.35), was painfully slow as I was exhausted and walked up a long, shallow hill to Shoreline Park. In the latter half of the chart (3.35 and above), the more consistent helped moderate the heart rate, which was slowly climbing. The slowly climbing heart rate in the latter half of the chart, indicates that I was running above my true endurance pace. One chart, lots to digest. I think it proves that pace strategy is the largest determinant of success in running. Had I taken it slower on the first half of the run, the latter would have been a lot easier and I wouldn’t have felt so exhuasted. I just started and didn’t have a sense of pace. – Yep, when I first start running, my body wants to go and it feels like I am running slower than I really am. It takes a mile or two before I can start to moderate my own pace based on feel. Solution: Run for ten minutes prior as warm-up and use my GPS to measure my pace initially. I listen to my iPod. Listening to techno (Scooter’s “Jumping All Over the World”) gets me pumped up and I want to run at the same pace as the music. It is rather hard to separate the body from the beat. Solution: Find a slower paced songs for an endurance run. Something like Podrunner mixes might work. The next time you go out and run, keep in mind your pace strategy, it’ll save your run. In fact, it could even save your triathlon. This entry was posted in Fitness, inspiration, Running, Training Charts, Workout Logs and tagged Running, Training Charts, Triathlon Charts, visualization, workout, workout logs. Bookmark the permalink. This is pretty much what I do. I usually have Friday as my day off so I can have a nice long run on Saturday. I did 7 miles in 69 minutes this last saturday. My running was a limiter and now it’s becoming better and better the more I train. Winter Run & Swim Blocks work awesome!